A careful and informed assessment of the "emerging church" by a respected author and scholarThe "emerging church" movement has generated a lot of excitement and exerts an astonishingly broad influence. Is it the wave of the future or a passing fancy? Who are the leaders and what are they saying? The time has come for a mature assessment. 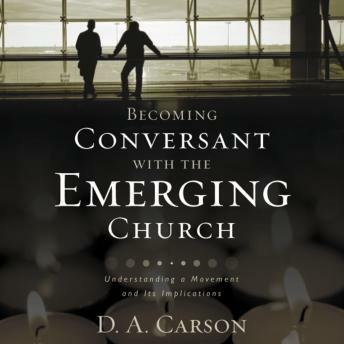 D. A. Carson not only gives those who may be unfamiliar with it a perceptive introduction to the emerging church movement, but also includes a skillful assessment of its theological views. Carson addresses some troubling weaknesses of the movement frankly and thoughtfully, while at the same time recognizing that it has important things to say to the rest of Christianity. The author strives to provide a perspective that is both honest and fair.Anyone interested in the future of the church in a rapidly changing world will find this an informative and stimulating read.D. A. Carson (Ph.D., University of Cambridge) is research professor of New Testament at Trinity Evangelical Divinity School in Deerfield, Illinois. He is the author of over 45 books, including the Gold Medallion Award-winning book The Gagging of God, and is general editor of Telling the Truth and Worship by the Book. He has served as a pastor and is an active guest lecturer in church and academic settings around the world.